The issue, which will be discussed at the 2020 Summit this week, has spurred a coalition of 30 organisations - including social welfare groups, research bodies and even a NSW local council - to form the National Alliance Against Alcohol Related Violence. The alliance has released a Roy Morgan survey that suggests more than 84 per cent of Australians, or 14 million people, believe that binge drinking is increasing and there is a link between this and increased alcohol-related violence. The survey also shows that almost 60 per cent of Australians say they are concerned about alcohol-related violence when they go out at night and an equal number are more concerned about alcohol-related crime now, compared with three years ago. The research was based on a national telephone survey of 694 people. [A survey of 1000 Australians found more than three-quarters of those questioned about attitudes to drinking said there was not enough public education about the dangers of alcohol, despite the Rudd Government's promise of a multimillion-dollar binge-drinking strategy. Figures from Nielsen Media Research show that alcoholic beverage companies spent $122million on media advertising in the 12months to November 30, up 11.9percent on the year before. The survey was undertaken by Galaxy Research for the April issue of the Federal Government-funded publication Of Substance. 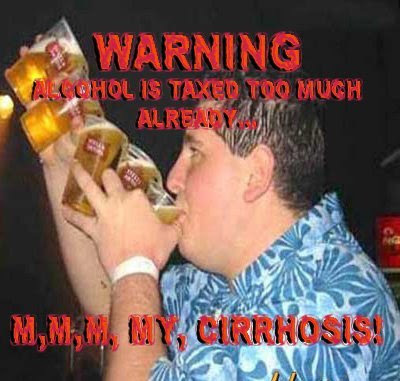 Australian National Council on Drugs executive officer Gino Vumbaca said,"Government campaigns can be quite effective but the money always runs out, but the alcohol companies' ads continue,"
All alcohol in Australia is subject to GST and a mix of excise or customs duty or the Wine Equalisation Tax is charged on beer, spirits and wine. 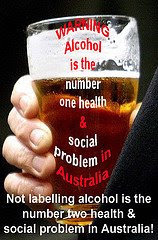 Alcohol is second only to tobacco as a preventable cause of drug-related mortality and hospitalisation in Australia. In 1998-99, the annual cost of alcohol-related social problems was estimated to be $7.6billion. Stephen Riden, spokesman for the Distilled Spirits Industry Council of Australia, said the cost is partly offset by Government revenue from taxes which it estimates to be $5.9billion this financial year. This group is demanding the Federal Government make alcoholic beverage companies spend millions on media, advertising - Warning-Dangers-of-Alcohol. The group is demanding the Federal Government tax all alcoholic products by their volume of alcohol and that alcoholic drinks be exempted from competition policy and be regulated separately. The group also wants state and territory governments to reduce the number of and opening hours of outlets that sell alcohol. The Federal Government did not respond to Herald questions. A spokeswoman for the NSW Premier, Morris Iemma, said the state government had appointed 30 police officers to new alcohol co-ordination teams and spent $2 million on the Alcohol Linking Program. The formation of the alliance comes as the Herald continues a year-long freedom-of-information battle to obtain the names of the hotels in the police's linking data. It also comes after the Herald revealed that the mayor of Randwick Council, one of the alliance members, wants to force the Coogee Bay Hotel and the Beach Palace Hotel to close their doors early in an attempt to reduce alcohol-related crime. Alliance organisations include the Alcohol Education Rehabilitation Foundation (AER), Australian National Council on Drugs, the Salvation Army, Randwick Council and the St Vincents Hospital Emergency Medicine Department (Melbourne). 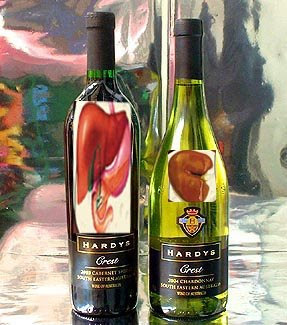 The chief executive of AER, Daryl Smeaton, said the level of alcohol-related violence was now at crisis point. The NSW Bureau of Crime Statistics and Research found almost 45 per cent - 33,147 cases - of the 74,091 assaults in NSW in the year to September 2007 were alcohol-related. A report for the Federal Government found the social cost of alcohol was about $15.3 billion in 2005. The Reverend Tim Costello, who will chair the communities, families and social inclusion discussion area at the 2020 Summit, said he wanted to change national attitude to alcohol. "I hope that by 2020 the idea of being intoxicated is as socially unacceptable as sexual harassment," Mr Costello said. "How we get there is a mixture of an alcohol volumetric tax - taxing strong casks of wine more heavily that light beer, which worked in the Northern Territory - and looking at the opening hours of pubs and the concentration of outlets." "I think it's now incomprehensible to young people that they can actually have fun without alcohol and without getting smashed," Mr Costello said. So what happened to Message on a bottle for binge drinkers? Quote: See the Herald seems to be playing a game it's called lets make sure alcohol is not labelled? For who may you ask? Corporations. Shame on the Sydney Morning Herald.